DENVER - Reporting live, from a ring side seat inside Casselman’s Bar in Denver, Colorado. Today is April 19, just one day before the historic high holiday in 2015, and the Poseidon team finds itself in the land of muscles, madams and muchos mustachios. 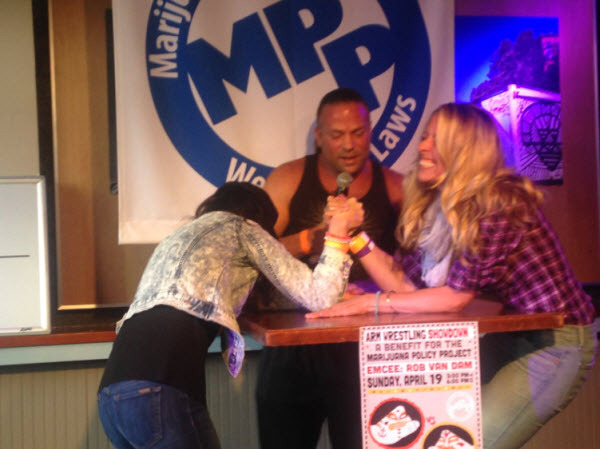 Today we are here in Denver for a very special arm wrestling match--one to benefit the Marijuana Policy Project, who has been instrumental in lobbying and changing the laws in this country to make them friendlier toward cannabis. Yes, this is fun, but the contestants here today are series. Dead serious. Beer, chips, and Red Vines flow freely as the well oiled contestants flex and flutter in their ceremonial robes. But look beyond the eye makeup and feathered boas and you will see some luminaries of the industry. Troy Dayton, CEO of the ArcView Investor Group, is in fine attire, wrapped in a gold lined business kimono. Ean Seeb, co-founder of one of Denver’s finest dispensaries, Denver Relief, is garbed in flattering Hulk-a-maniac wear, complete with Hogan's blonde mustache, fiery bandanna, and feathery mullet. Emily Paxhia of Poseidon is also competing, and has dressed her eyes in alluring and fanciful psychedelic makeup. It may have no place in the boardroom, but it's perfectly fitting for the spirit of the night. 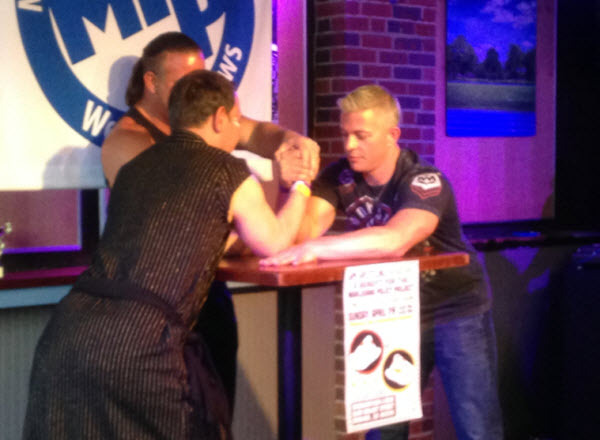 Our host tonight is none other than world famous professional wrestler, Rob Van Dam. Having experience in sports of brute strength, he is specially equipped to officiate the proceedings to ensure the rules are followed, and most of all, that no one gets hurt. 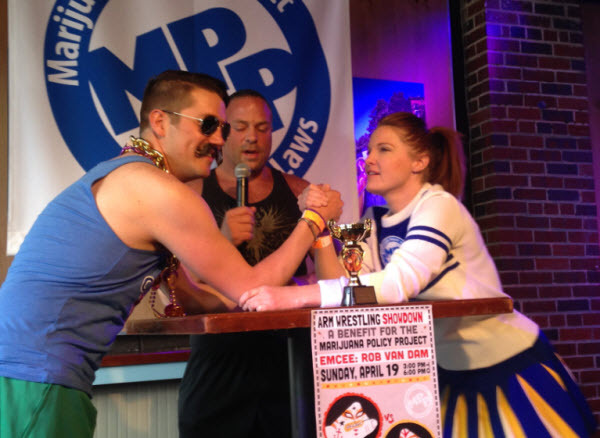 Emily’s match is one of the best of the night, She was very evenly pitted against a ringer when her first competitor, obviously frightened of Ms Paxhia's arm wrestling prowess, dropped out at the last minute. This new girl is well equipped, though, and the match stretches on for over a minute and a half of struggle before being called when Emily's opponent pulled an illegal grip move. In round two, the ladies were forced into a southpaw match, left on left. This one was quicker, and sadly ended with Emily’s defeat. Other participants in the evening's competition include Tripp Keber of Dixie Elixers, Jaime Lewis of Mountain Medicine in Denver, Betty Aldworth of the SSDP, Jane West of Women Grow, and MPP’s own Rob Kampia. I won’t give the blow by blow, as reading about an arm wrestling match really can’t compare with the pure adrenaline rush one gets WITNESSING it first hand. Instead, we are including a generous amount of photos for your enjoyment. To aid the experience, imagine a lot of very loud, inebriated yells of encouragement, as this affair is by all means a rowdy and raucous one. The winner of this year’s match? Deservedly, it is the very buffed and well prepared Jason Glowacki of Glow Industries. Well done, Jason! Well done, contestants! 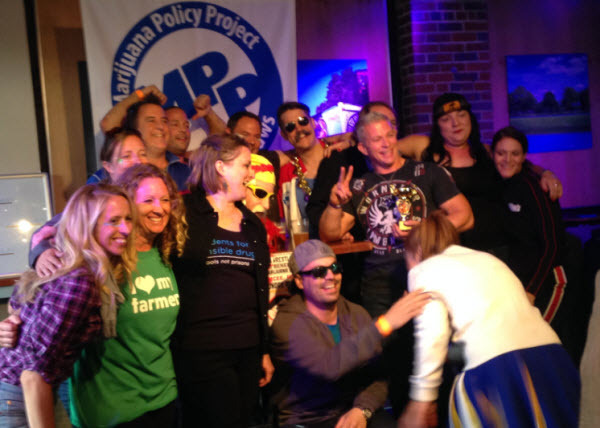 It was great to see such a fun event benefiting MPP. We are looking forward to next year's event.